Marvel’s greatest heroes unite in the pages of a monthly team-up adventure! After a science demonstration at Empire State University goes awry, Ms. Marvel and Spider-Man find themselves tangled in a chaotic adventure that’ll see them stretched thin to save the day! Is the team-up meant to be or is it just a disaster in the waiting?! Rising star Eve Ewing teams with artist Joey Vazquez for the endless fun of Marvel Team-Up! 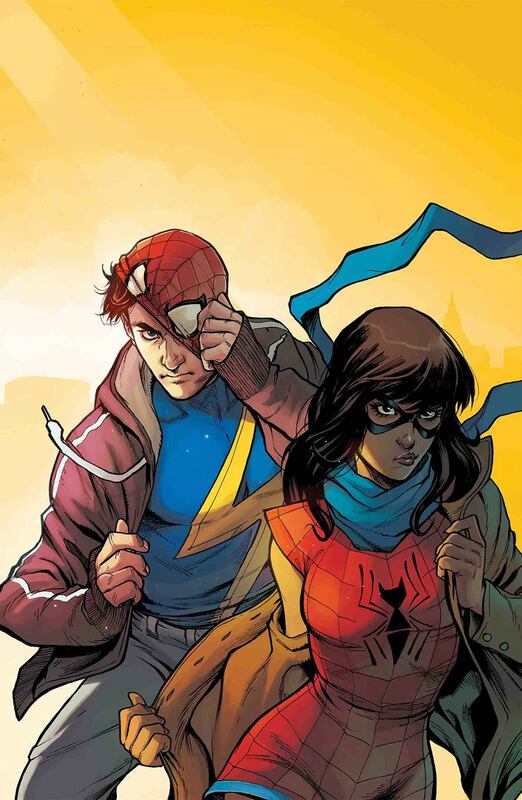 Looks like trouble for our hero, Spider-Man, also known as Kamala Khan. Er...wait. We mean Ms. Marvel, also known as Peter Parker. Dang, that's not right either. Peter Khan? Kamala Parker? Well, whoever it is, this duo isn't feeling so dynamic at the moment, and they need to work it out fast.